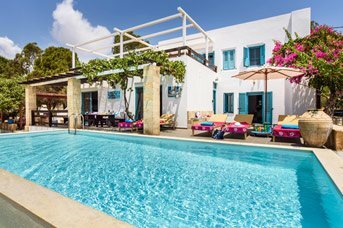 Built along a single street running parallel to the beach, Pefkos is made up of modern, low-rise hotels, luxury villas and self-catering apartment complexes set in gardens with pools. As most buildings are no higher than three storeys, it still bears some resemblance to the village it once was. People come here for the peace and calm, so it is not much of a party animal at night. It’s more about relaxed conversation over cocktails, cold beers or local wine, or chatting over an ouzo in the garden of a little tavern. If you don’t want to cook at your villa, great food is to be found in the restaurants along Main Road and Main Beach Road but if you feel like late night dancing or a burst of live music, head for Lindos, just a 10 minute drive from your villa.With its golden sandy beaches sloping gently into the Aegean Sea and laid-back friendly atmosphere, it’s easy to see why the beautiful village of Pefkos is such a popular holiday destination. 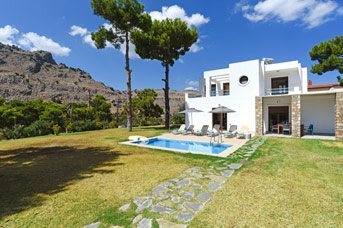 Pefkos slow-paced way of life gives this resort a relaxed ambience but is also nearby the livelier resorts of Lindos and Lardos. Home to a variety of tavernas, shops and eateries, there is plenty to eat, sea and do in Pefkos. Home to small supermarkets and a bakery selling sweet and savoury treats, Pefkos is well catered to keep you stocked up on supplies throughout your holiday. There is a selection of souvenir shops selling leather goods, ceramics, jewellery and trinkets. Further up the coast, Lindos is a hive of small boutique and craft shops – perfect for indulging in some retail therapy. Head into the more cosmopolitan Rhodes Town, old and new, for a variety of designer and high brands. Pefkos offers a variety of beach front bars and restaurants, some of which offering evening entertainment. Traditional Greek dishes as well as a large variety of international cuisine is available from the large selection of restaurants in Pefkos meaning that there is something for everyone. Venture down into Lindos for an even greater choice of dining experiences and a selection of open air night clubs open in peak season. Get a taste of real Greek life in the traditional village of Lardos with plenty of restaurants serving authentic Greek cuisine. Stop off in the evening in the bustling village square and relax with a cocktail. Le Beach is the main sandy Beach in Pefkos with Blue Flag status, sun beds, water sports, boat trips and plenty of beach bars and restaurants on hand. Watch the local fishermen moor their boats at St Thomas Beach – great for swimming and snorkelling and with rockpools at one end of the bay. Stretching towards Lardos with golden sands that gently shelve into the water, Plakia Beach is a firm family favourite. If you’re lucky, you might spot a Sea Lion in Fokia Bay – the animal which the bay is named after! Hop on a glass bottom boat trip and explore more of what this beautiful coastline has to offer. Or, hire your own boat and dive into the cool Ionian Sea in one of the Islands undiscovered bays along the east coast. Along the main street in Pefkos, attempt the MrE Escape rooms and 9D video pods for a sensory experience. Pefkos has a small waterpark with its own taxi service and a burger and deink included in the ticket! For more excitement, head to one of Europes largest waterparks in Faliraki with both adrenaline packed, as well as more gentle slides meaning the park is suitable for all ages. A few minutes’ north of Pefkos is the picture-perfect town of Lindos, home to the ancient acropolis, Rhodes most famous cultural attraction. With traditional white washed buildings, cobbled streets and 2 sandy beaches, Lindos is well equipped for day trips as well as providing venues for those looking to dance the night away. Rhodes Old Town, a World Heritage Site, is an impressive medieval town home to the Palace of the Grand Masters and several other monuments from the time of the Knights of St John. Stepping inside this walled city feels like being transported back in time and will give you a real flavour of Rhodes history.